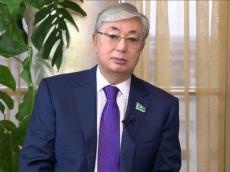 The fight against corruption will be intensified in Kazakhstan, President of Kazakhstan Kassym-Jomart Tokayev said while meeting the population of the country's Turkestan region, Trend reports via Kazakh media. "Justice in society, first of all, is connected with executive bodies. The main task of the government, ministries, akims [regional executive power bodies] at all levels, police, prosecutors, courts is to protect the rights of citizens. In this sense, my main position is clearly and obviously the rule of law," the president stressed. The new president of Kazakhstan, Kassym-Jomart Tokayev, has made his first working trip to Turkestan region. The program of the trip included acquaintance with the construction of a regional center, inspection of a number of industrial and social facilities, meetings with the public.